HOW DOES ULTICOLOUR PRODUCE BRIGHTER COLOURS? Asphalt is an incredibly versatile and durable material with a unique ability to accommodate movement without cracking. However conventional asphalt is visually limited by the black bitumen binder. The only choice of colour is restricted to black, or red where an iron oxide pigment is added. The resulting colour is a muted dark burgundy colour. ULTICOLOUR asphalts are different, they use a high quality clear Mexphalte C binder and bright colour pigments to produce vibrant colours. It also uses high quality colour matched aggregates to produce deeper colours that resist surface wear. No two projects are exactly the same. By combining our unique experience in asphalts with our access to high quality aggregates we are able to supply coloured solutions that perfectly match client requirements. 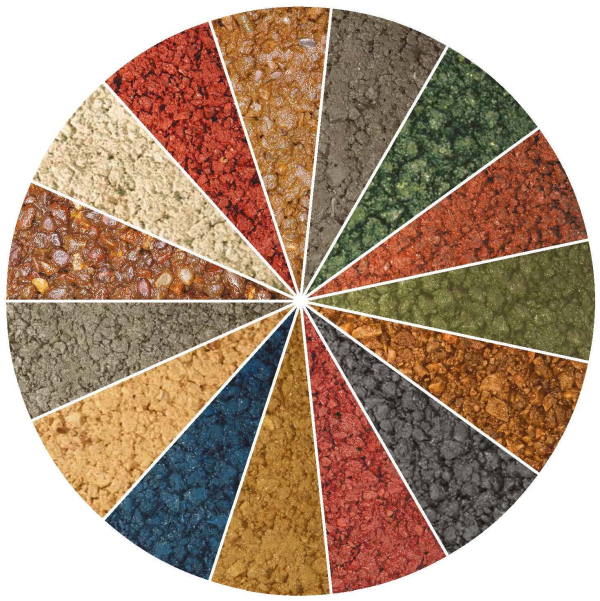 Available in a range of colours with a wide range of complementary aggregates, ULTICOLOUR offers an exceptional choice of colours and finishes. Matching pigments to high quality, coloured aggregates ensures consistent colours and a longer lasting finish that resists surface wear and keeps its appearance for longer. Over 100 UK quarries give us access to a huge range of coloured aggregates and our specialist production plants allow exceptional quality control to ensure consistent colours and finishes. ULTICOLOUR is available as a 6mm, 10mm and 14mm size SMA surface course for a wide range of applications from play areas and pedestrian zones to highly trafficked bus lanes. It is also available as a porous asphalt to eliminate the problem of surface water. When installed as an SMA, ULTICOLOUR has a tough durable finish, that resists damage from weathering, and normal trafficking to keep its distinctive colours and premium appearance for longer. Coloured asphalt surfaces play an increasingly important role in road safety, offering improved visibility in high risk or low light environments. The monolithic surface of ULTICOLOUR also avoids trip hazards that can be experienced from block pavement movement. How does ULTICOLOUR achieve long lasting colours? By using coloured aggregates that are carefully matched to the chosen pigment, ULTICOLOUR produces consistent colours that resist surface wear. How does Tarmac ensure consistent colours? Our network of UK quarries and specialist production facilities ensure exceptional quality control for consistent colours and finishes. Why is ULTICOLOUR faster to lay than block paving alternatives? ULTICOLOUR is laid using the same methods as conventional asphalts and can be opened to trafficking just as quickly too. Can I use ULTICOLOUR in play areas? ULTICOLOUR can be used in play areas and is also available as a porous surface. Why is ULTICOLOUR a safer solution? ULTICOLOUR helps draw attention to hazardous areas like junctions or pedestrian zones. It delivers a smooth, even surface that avoids the common trip hazards associated with block paving. When specified as a porous solution, it also eliminates the problem of surface water and ice. Where can ULTICOLOUR be used? With such a wide range of colours and finishes, ULTICOLOUR has been used in a range of settings from simple, classic neutral coloured asphalts in modern commercial and residential developments, to brightly colours surfaces in playgrounds. Why is ULTICOLOUR such a versatile solution? ULTICOLOUR is available with a wide range of aggregates and pigments as a durable Stone Mastic Asphalt (SMA), a porous asphalt for improved drainage or as pre-coated, coloured chippings for use with Hot Rolled Asphalt mixes. Is ULTICOLOUR resistant to fuel and oil damage? Although the binder in ULTICOLOUR offers some improvement in oil resistance, we would recommend using ULTISHIELD, our specialist fuel resisting asphalt.